Contains Glory issues #23 - #34. @bookblrb: A young girl who has been dreaming of half-god, half-demon Glory tracks her down and joins her army. Every year Rose and her friend Windy become neighbors for ten days at summer cottages near the lake town of Awago Beach. These trips have been high points of their childhoods, long days full of swimming, digging in the sand, and getting candy from a little store. But this summer is different. Something has changed that neither girl can quite put her finger on, but of which both are painfully aware. Rose sees her parents growing apart and wants to blame her mother; Rose can’t comprehend her mom’s recent miscarriage and feels like the pregnancy was a personal betrayal that indicated that Rose wasn't enough for her mom. Rose is irritated with Windy, who, a year-and-a-half younger than her, is still a kid and has totally different reactions to everything going on around them. Why I picked it up: I first became aware of this book in the middle of a typical gray Seattle winter. Nothing could have sounded better than summer. Plus I really wanted to read the Tamaki cousins follow-up to their amazing debut, Skim. Why I finished it: This book is filled with details of what it is like to be a young girl painfully inching her way into adolescence. It made me think of a summer from my tween years when I was lucky enough to be swept up by the family of a girl I barely knew and taken out on a weeklong sailboat trip. This book brought that time back to me. I was equally obsessed with candy (butterscotch or caramel Jolly Ranchers Stix) and nervous around teenagers with their totally foreign emotions, flirting, and drama. Readalikes: Fans of Sara Ryan's books (especially Empress of the World and Bad Houses) will appreciate how the Tamakis' nuanced characters struggle to find identity in the midst of heartache. @bookblrb: Rose and Windy love their summer trips to the lake. But this year something has changed. Detective Gould has never met a case he couldn't solve, but strange things are happening that even he can’t explain. There’s a thief who only steals chairs, a novelist swiping stop signs for the typefaces, and a con man who destroys and then resells priceless art. And somehow connecting them all is a performance artist. It’s a tight, noir-esque mystery with twists you won’t see coming. Why I picked it up: Graphic novel + mystery + art = three of my hankerings in one book. Why I finished it: The way the narratives interlocked reminded me of the structure of Pulp Fiction. It kept me on my toes as I tried to figure out how every character was connected. It's perfect for: Fans of old-school detective stories (Dashiell Hammett, Raymond Chandler, et al.) will love the whodunit aspect and Detective Gould’s straightforward, world-weary ways. I’d also give it to my friend Michelle, a former Army intelligence operative, because of its criminal psychology subtext. @bookblrb: Strange, inexplicable things are happening around Detective Gould in this noir-esqe mystery. Hans Rickheit, the author of The Squirrel Machine, has created a graphic novel with as much plot and logic as a series of bad dreams. There are one-page pieces that invoke R. Crumb, such as “Let’s Get Happy” in which a series of smiling people try to persuade you not to smile at all. There are longer, creepy vignettes like those featuring a teddy-bear-faced man. In one he presses two cats face-to-face and produces a single creature with no heads, two tails, and eight legs. Or you can follow the wanderings of the two masked twin sisters, Cochlea and Eustachia, as they follow the illogical, dangerous path the artist has drawn for them, no matter what the consequences. Why I picked it up: Gene has a habit of giving his reviewers some very unusual books. I was interested in this one because Rickheit’s style is similar to Jim Woodring's, although it lacks the cuteness of Frank or Jim. Why I finished it: This was like driving by a bad accident and slowing down because I can’t look away. There are some images that crept under my skin in the way that the art of Charles Burns does. Its clean lines and mostly black and white art invoke viscera. It's perfect for: Randy. He’s got a sick sense of humor, so I know he would enjoy “Hail Jeffrey,” in which a toad-like creature dominates his exhausted butler and a despairing girl plus an entire crowd of adoring subjects. As he shoots them with a massive revolver, he cackles with glee. @bookblrb: A graphic novel that reads like a series of creepy dreams. The Nekton family explores the ocean, examining its mysteries and protecting its secrets. In Here Be Dragons, after an earthquake off the coast of Greenland they follow up on reports of a sea monster. The Vanishing Island finds them in search of a perplexing island that is simply not behaving as it should. 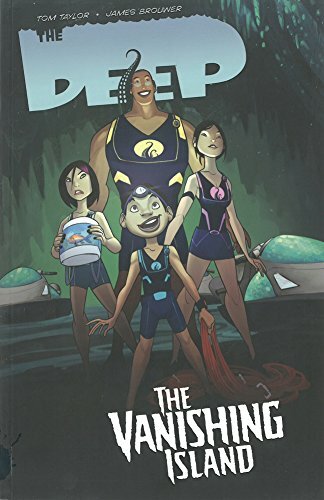 In both of these adventures, the Nektons uncover treasure and secrets that propel them toward one of the ocean’s oldest and greatest mysteries. Why I picked it up: They were recommended as good, all-ages graphic novels for my school library. The artwork is as engaging as the storyline. James Brouwer gives the Nektons and their companions priceless facial expressions. Ant’s exuberance stretches from ear to ear while his sister, Fontaine, has one corner of her mouth arched in perpetual exasperation. Joy, terror, and disbelief play out across the characters’ faces. Juxtaposed with gorgeous backgrounds that capture the ephemeral quality of light found beneath the ocean’s surface, the art is perfect. Readalikes: Amulet, Zita the Spacegirl, and Super Dinosaur are other all-ages adventures with real substance. For a deep sea adventure with more mature content, Scott Snyder’s The Wake is a darker, scarier, but equally riveting look into the depths of the ocean. @bookblrb: The adventures of the Nekton family as they explore the mysteries of the ocean. Otogi grew up knowing he was a descendent of the Brothers Grimm, but he never realized that their stories were true. Now, with the help of a male Cinderella, he must unlock the power of the original Grimm’s Fairy Tales and use it to bind the demons who want him dead. Why I picked it up: I like stories that play around with classic fairy tales. Why I finished it: Because I love oddly silly manga and Dictatorial Grimoire has a nice mix of silliness and action. Most of the fairy tale characters are hot guys who wear beautiful, flowing, and often feminine outfits. They flirt with Otogi a lot, and there are a lot of pretty boys posing prettily. Cinderella gets off on being bossed around. Snow White can't look in mirrors because he's afraid of seeing his face and realizing he isn’t actually beautiful. Kanou knows the original stories quite well. For example, Puss in Boots is a talent agent, while in the original he turned a poor miller's son into the "Marquis of Carabas." Readalikes: Cardcaptor Sakura by CLAMP also features magical beings who have escaped from a book, but its main character is much younger and female. (The fashions are no less fabulous, however!) Those who want to read about boys who do more than merely flirt with boys in adaptations of classic tales should try One Thousand and One Nights by Jeon JinSeok and Han SeungHee. @bookblrb: A descendant of the Brothers Grimm must unlock the power of the original tales to battle demons. Gaiman retells the grimmest of Grimms' tales. His delight in delicious details is captured in Mattotti’s swirling, black illustrations which perfectly convey the darkness that runs through this tale. No sooner have the kids nibbled from the gingerbread house than the old woman welcomes them in, drugs their food, drags Hansel to a cage, and mutters one word, “Meat.” While the boy is being fattened for slaughter, Gretel is kept chained in the house, forced to cook and clean. But when Hansel is ready for roasting, Gretel tricks the old woman and cooks her instead. Why I picked it up: I’m a huge fan of Neil Gaiman’s books, especially Coraline and The Graveyard Book. Repulsed by the thought of sacrificing his own children but fearing starvation and the wrath of his wife even more, Hansel and Gretel's father agrees to abandon them in the woods. The first time they survive because Hansel drops a trail of small stones that lead them back home. But the second time, they are truly lost. Then they spy the gingerbread house with smoke curling from the chimney, beckoning them closer. Readalikes: Hansel and Gretel are lead characters in Adam Gidwitz's trilogy of maudlin, tongue in cheek YA novels which start with A Tale Dark and Grimm. Gidwitz's narrator frequently interrupts the traditional "once upon a time" storytelling flow to warn the reader (and always in bold type, no less), "This story is like no story you've ever heard. You see, Hansel and Gretel don't just show up at the end of this story. They show up. And then they get their heads cut off. Just thought you'd like to know." Readers looking for more traditional retelling of the tales will enjoy Philip Pullman's complete Fairy Tales from the Brothers Grimm. @bookblrb: Neil Gaiman retells the grimmest of Grimms' fairy tales, featuring a candy house and a boy fattened for slaughter. This is a meditation on the end of a young man’s relationship with his girlfriend, and perhaps the end of his life. All around him (and all around everyone, really) are fantastic things that go unnoticed: giants, strange skeletons, ghosts, shadows, asteroid-throwing aliens, important emails, tumors, and more. Any of these would make life a little more thrilling or mysterious. Some of them would make it better. Why I picked it up: Several of my friends told me about Pearson’s Hildafolk series at TCAF last year, so when I picked up a copy of one of those I bought this small graphic novel, too. Why I finished it: I loved the idea of the anurids, weird little creatures that are fascinated by human beings. They’re all around us, observing. They silently move to always stay just out of sight. Readalikes: Another inventive book about the end of a relationship, the Choose Your Own Adventure spoof Love is not constantly wondering if you are making the biggest mistake of your life. @bookblrb: At the end of a young man’s relationship, he fails to see things around him: ghosts, emails, tumors, and more. For 100 years human galactic culture, The Quantinuum, has been coordinated by an artificial intelligence that lives at the heart of a black hole. The centennial iteration of the superhero team the Hypernaturals has disappeared while tripping to 28 Kosov. The planet has gone dark. 16.7 billion people were in transit through the trip network’s routing node on 28 Kosov at that time. There is a real possibility they and the team are dead. Probationers are being given temporary active status. Retired Hypernaturals are being called in to consult. When they finally get to 28 Kosov, they find a planet-sized fingerprint that implicates a jailed supervillain. They also spring a trap. Contains material originally published in The Hypernaturals #1 - #3 and The Hypernaturals #4 - #8. Why I picked it up: Abnett has written some great science fiction comics, including Marvel’s Guardians of the Galaxy and Annihilation. Why I finished it: The narrative bounces from present to past to tell a great story. From the first moment it had me asking, “What happened?” and then it filled in just enough of the backstory to keep me reading along until I started asking more questions, which it answered. If it had been told in an entirely straightforward, chronological manner, I wouldn’t have kept reading. Breaking it up like this made it something special. And I loved the Hypernaturals recruiting ads / posters scattered throughout the book. They remind me of the famous “Got milk?” ads. 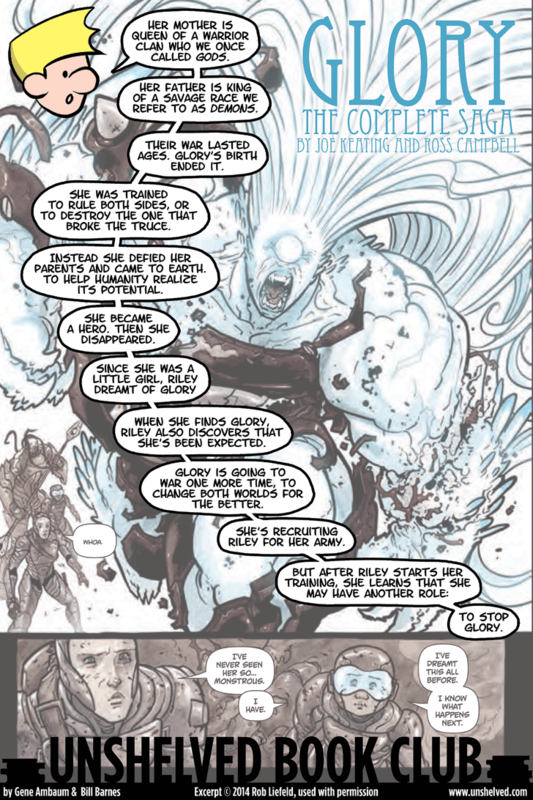 Readalikes: Jonathan Hickman’s epic, galactic-level series and all of its tie-ins, Infinity, which features your favorite (and some less famous) Marvel superheroes in space fighting unimaginably powerful foes. @bookblrb: A replacement team of Hypernaturals goes to 28 Kosov to find missing members and foil a villain’s plot.